This is your typical launcher upgrade flash game. The theme is cute and simplistic, and the goals are straight forward. 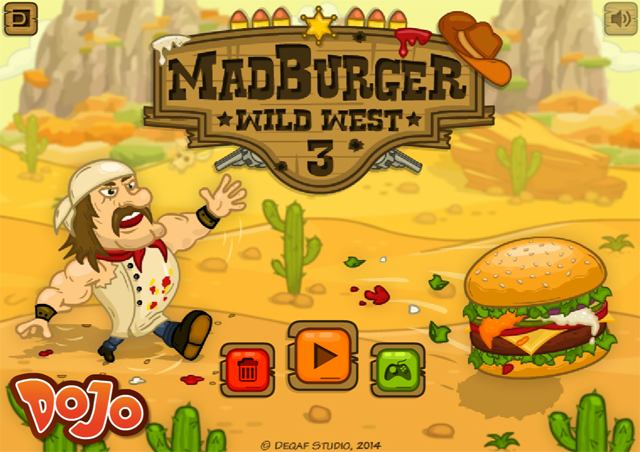 Set in the Wild West, your objective is to build a burger with the best ingredients, and then launch it over the desert. The farther you launch it, the more money you get for this projectile piece of meat. If you launch it low, you hit and receive money for limes, but if you launch it a little higher, you hit stars, and make more money. There are also funny power-ups and pitfalls littered in the sky. Careful or you might accidentally land on an Indian Chief! The advice for making the burger comes in very sparse intervals along the ground. It would be nice if they were a little more common. Some of the power ups, and even the stars do not really tie into the Western theme. I would have liked to see more of a cohesive selection. This game involves you throwing burgers. That alone makes it awesome, but what’s even better is that you can propel your burger higher by squirting sauce out of the back! Overall I really enjoyed the game. Its simplistic and entertaining! What more could you ask for?